I've got a few choices to choose from in this feature on one of my favorite types of shoes, moccasins. We cover all bases from traditional brands, obscure americana and modern interpretations. Click the full post if you're interested. Visvim Lhamo-Folk. $400-$600 depending on retailer. The visvim Lhamo folk represents a modern interpretation of a traditional native American silhouette. The materials are sourced in the USA, but I'm under the impression that the shoe itself is manufactured in Japan or China. That is one large minus depending on what you'd like in a moc. The pluses that these offer over simpler options, is obviously the advantage of newer technology. The shoe features a thick and durable sole and cushioning usually reserved for running shoes. The additional minus is the double edged sword that comes with most tech, the aesthetics are not 100% authentic. The price is also something that is worth consideration, seeing that because the model is highly sought after, the shoe can range anywhere from $400-$600. Town View made in Maine deerskin lined double soled moccasin. ($89 straight from the home factory) Obviously a beautiful made in the USA option from a small handsewn factory out of Dexter, Maine. The plus is that you get a authentic product, the sought after aesthetic of a hand/homemade Canoe Moccasin. The minuses is the lack of more advanced padding and comfort via new materials and technology. The upside is that the shoe features a double sole and a deerskin lining which balances out any aversion to notions of comfort. Finally the price is the ultimate plus for the mocs. They are only $89. I am unsure of time it takes to ship out since the owners handcraft each pair individually but whatever it could be would be worth it for that price alone. A comparable model from Quoddy goes for $215 plus production time. Check out this youtube video if you're interested. The Creeper by Itasca is a chukka 4 inch moccasin based on a canoe sole. ($89 Itasca) A moc made by a couple out of Lake George Minnesota. The shoe looks great and comes in Elk, Buffalo and cow leather. You can get the moc with or without fringe, I suggest without but that's up to you. The moc's pluses are it's obvious uniqueness and choice of leathers. Elk leather is remarkably soft and looks amazing. The minus is that the mocs look very basic and utilitarian but that may be a plus depending on what you're looking for. The price is right and you'd be ahrd pressed to find a more authentic moc. The Navajo 1 button moccasin is a traditional southwestern native american moc. ($84 at City Electric Shoe Shop handmade in Gallup, New Mexico) Visvim made an attempt at an interpretation of this classic southwestern moccasin called the "coyote". 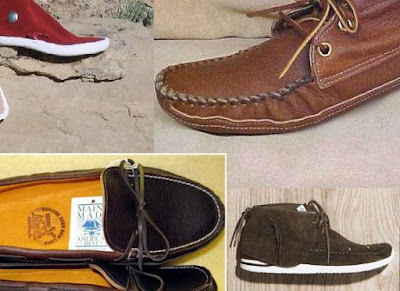 While this retailer describes the moc as a Navajo moc, it is actually prevelant in many southwestern tribes. It features a thick hide sole and cowhide upper. The moc is comfortable and durable and isn't quite like anything else. If you haven't tried a one button style moc, I'd say this model is a good choice and at $84, the price is right. Great post, didn't know about a lot of these options. Do you have any idea about the comfort level of those town view, especially in comparison with quoddy? I wanted to first say thanks for commenting on the blog. It's nice to get some feedback and I really appreciate it. As for the Quoddy/TV mocs, from the looks of it both options are almost identical. I'm talking about the Grizzly moc of course by Quoddy which is not currently for sale unless perhaps you can special order it. Quoddy offers the option of a crepe sole on it's similar moc, but I'm thinking Town View may be willing to work with you on that. Thanks for the info. Enjoy the blog a lot (directed here from comments on hyr (i always comment as "David")....a lot of hyr commenters have good sites actually. I'm planning to start my own soon so I will be sure to send you the link when I do. I think you can just order the grizzly mocs on the quoddy site, but given that these look so similar and seem to be made well, I'm hesitant to pay quoddy prices and wait quoddy months for delivery. These look like the canoe mocs without the camp sole, which is a great option. If I end up getting them I'll update you on quality/fit. I'd just like to say that I've been reading this blog for a few weeks now and have been really enjoying it. Like David above, I was directed through hyr. Cheers. great to hear, be sure to send the link when you get your website up and running. Also I'd be excited to hear about the TV mocs, I've heard some really great things about the construction and am thinking of picking up a pair myself.